Walk-in, walk-up, genius bar are names for an old concept: a service desk where customers can come in. This has emerged as a new popular idea and for good reasons. The most compelling reasons are the customers mobility, and the need to react to competition. Walk-in support is not for everybody. A must is that IT operations are in a good shape. If you are in a fire fighting mode, you will need your people fighting the fires, not sitting in the service point. Geography and mobility are also important elements. Walk-in support is ideal when a large part of the workforce is mobile and there are large offices with suitable locations. A walk-in desk is like any shop, it needs to be where the people are, or specifically, where they walk by. Let’s look first at mobility. Most office workers today opt for a portable device and many have more than one device they use at work. Of course most problems can be solved on the phone but sometimes this is difficult and/or time consuming. For example sorting out problems with a smartphone is quite hard to do while talking in it. Many office workers do not have fixed desks anymore, so if they need to have a service desk person visiting them, they need to arrange a meeting. Even if they have their own office, the easiest way is probably to walk to the support desk with the device and have the problem sorted out there. The devices are often critical for the employee; they cannot be productive without their tools. They need immediate fixes or replacements so that they can do their work. The case for walk-in support depends on the number of mobile workforce, the more you have the more you need to offer walk in support. It is also critical that that there are central locations. Shadow IT and BYOD are new phenomena which are examples of competition for the internal IT. People are aware of opportunities and solutions that IT does not offer or does not seem to offer. It is a common story in the corporate world that a new thing is first forbidden and then embraced. If IT spends its energy and resources fighting new solutions, it is wasting its time and may be hurting innovation. It is far better if IT responds by offering new tools and supporting emerging practices. Choosing the right tools can be bewildering with all the possible options. Most people would like to have some advice in selecting from the myriad options. A genius bar -style support desk would have a lot of options available and advice what to choose. That would be a positive way to react to competition, fight it with better service. The walk-in support gives IT a face. Most of the IT work is invisible to the customers. If it works well people think it is effortless and easy. Good, visible service improves IT’s reputation. Walk-in support may also save money. Traditionally it has been the service desk people who have visited customers when they were not able to solve the problem on the phone. This means that the support person must spend a fair time walking or travelling. A common story is that when the support person visits some office, there are other people also needing help and this latent demand makes visits long and schedules become unpredictable. One specific need for walk-in support is the moment when somebody receives a new device and needs to set up it and become productive with it. It will be much easier and smoother with the help of an expert than without. The walk-in support does not replace the service desk. You will still need people on the phones. You should not mix these duties, it is not a good idea to have service staff doing phone support and face to face service at the same time. Rotating shifts is possible but some people may be better on phone than face to face. The walk-in desk should be centrally located, preferably in a place where all employees see it daily. There might be a separate place(s) for appointments and a standing desk for quick ad hoc visits. The visual image needs to be friendly and open, the competition are the computer shops at the local mall. The shop should be open when there is traffic. If the office is small the opening hours may be shorter than the office hours. In small offices the walk-in desk might be open only on some specific days in a week or month. You probably should have a booking system for longer visits like setting up a new phone or tablet. These should be easy to schedule as there is no immediate urgency. There must be also an opportunity for emergency visits or ad hoc queries. The visits are naturally logged the same way as calls. The goal is to solve the customer’s problem one way or other during the visit so that the support ticket can be closed immediately. Sometimes there may be a fault that needs to be fixed after the visit. For example the customer may receive a replacement device for loan while the faulty device is sent for repair. 3 How satisfied you are with the support? I received 48 responses. Most of the responses were from the customer role (30) and only a few were from SD employees. In the report I combined the SD managers and employees responses. 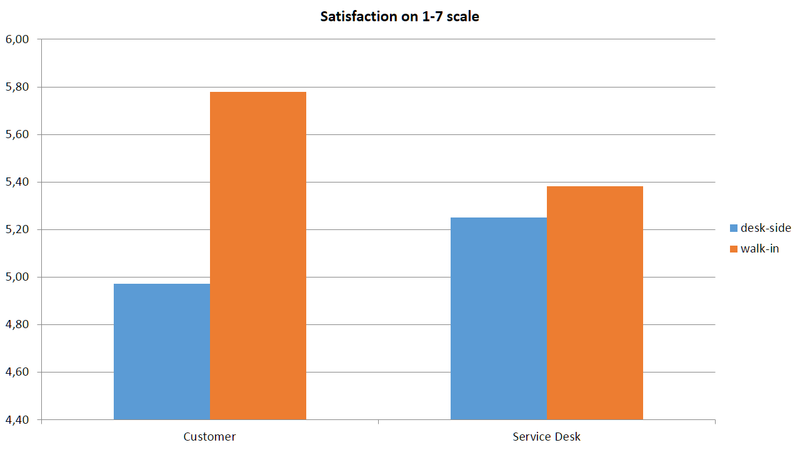 It shows that 55% have the traditional desk side -support model but over two thirds have a walk-in service desk. No deskside support is available for 17 % but majority of these do have a walk-in option. Here we can see the satisfaction do different solutions based on the role of the respondent. We can see that customers clearly prefer having the walk-in option. 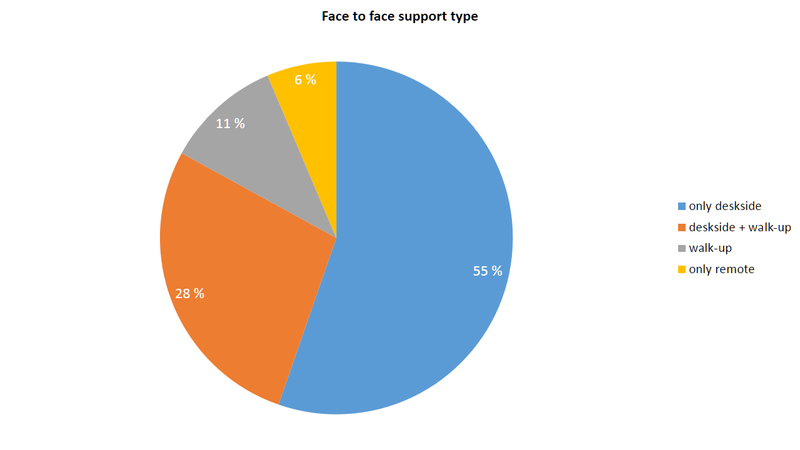 Having no near support is very unpopular, only 2.7 on the 1-7 scale but there were only three responses. This article was written before I made the survey but I decided to wait till I see the results. My hypothesis was that walk-in support exists and that customers like it. These were shown true. My third hypothesis was that people would be required to book visit times, this seems to be relatively uncommon. Several people commented that schedules are a problem with desk side support. Walk-in support seems to work well and the customers see the difference better than the Service Desk people. If you do not have a walk-in desk, you should consider it.